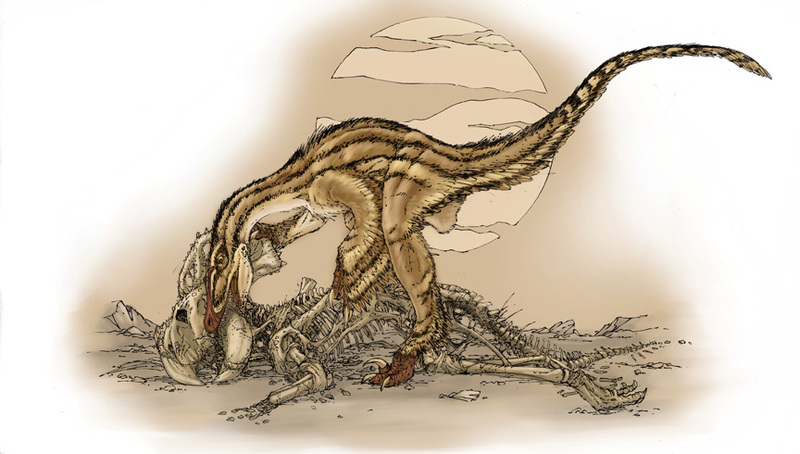 Carnosauria: Velociraptor and Protoceratops, let's dig in! 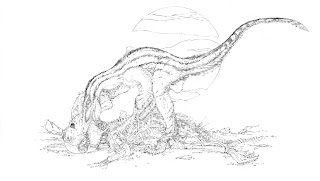 So over on Dave Hone's Archosaur Musings, Dave asked if anyone had any art for an upcoming paper. I have a bit of free time right now so I offered my help. The only real problem? They needed it by Monday, it was Friday night. Not to worry, I said I'm pretty quick with the pencil. So i decided to time myself. I did the layout on Saturday after I got a bit of info and then Saturday I got to work. Now I don't really ever pay attention to how fast I go or that kind of thing but I started this at 8:45 am in Sunday. I finished at 11:11 am. I did take a few minutes break to cook some hamburger for the dogs but that only takes a minute to put on. I wanted to get this to Dave ASAP since I know how printing deadlines are. I did add a spot of color later to help define the different animals since the actual image would be fairly small. I should have asked about the final size, it was a stupid mistake I draw fairly large (comics are reduced a lot so it makes things 'tighter') but the spot of color helped pop the dinos a bit. It might not get used at all since the editors decide that type of thing but Dave wrote up a blog post about it if you're at all interested in a velociraptor eating/scavenging a protoceratops! I figured the little backstory might be interesting to the other artist and Dave is a far better wordsmith than I, so head over and read all the gory details! Yeah the colour deffinitely helps bring out a clearer image when viewed at a smaller size, love the patterning and colour choice on the raptor. Reminds me of a Genet. I Like the coloring but I don't like how it is so local to the raptor. 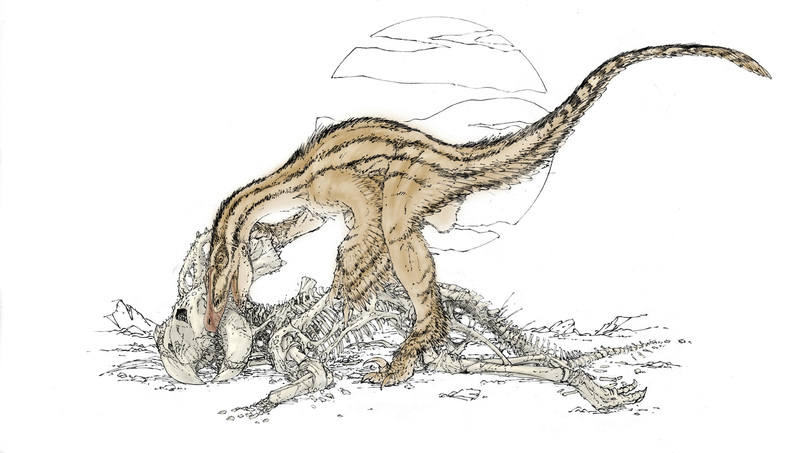 Those Protocerotops bones are wicked, and the paper is about the interaction between species, so I think I'd like perhaps more leveled coloring. Maybe stronger shading to bringout the volumes... but as is the color subjigates the fantastically rotting bones to a background role. Other than that picky critique - hot stuff! I wasn't going for anything particular color wise. It wasn't supposed to be in color at first, just black and white. The colors were an after thought to try and pop the dinos at such a small size, they are down and dirty, so I can't disagree;) I didn't hear back from Dave until late Sunday and I had to be out early the next day so the 'colors' were done in about 20 minutes. Even though I've been drawing these animals for 10 years, I still have a lot to learn and doing these kind of drawings is great for that.